This is Valentines weekend so please make reservations in advance. WEST COAST Premiere of " JUNGLE CITY "
This incredible versatile trio was founded in the Spring of 2008. 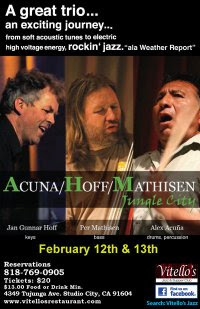 It's the legendary drummer/ percussionist Alex Acuna meeting two of Norway's greatest musicians, Jan Gunnar Hoff on piano/keys and Per Mathisen on upright and electric bass. The trio has been touring extensively around Norway in 2008 and 2009, giving performances in clubs, at major jazz festivals and doing clinics for music students. July 2008 the trio played at Jazz festival Steyr in Austria and made their first album for Alessa records. The music from this trio stretches out in various directions from totally acoustic modern jazz into floating electric landscapes and further in to burning high voltage rockin' jazz. Always with superior musicianship, fantastic interplay, a great deal of humor and the love for music, pluss killin' solos and improvisations. Here you will find lines back to jazz history from both the acoustic era and from the electric Weather Report era, never with sentimentality but with respect and honor.